Youth unemployment has been at records levels, with around a million young people out of work in the UK in 2013. The UK Commission for Employment and Skills (UKCES) works to promote employment opportunities. They came to Neo for help generating awareness of the benefits of employing more young people. The UKCES comms team had already made a splash in the media with research that suggested ‘the end of the Saturday job’. But now they wanted a six-month programme of digital activity, anchored around the monthly release of the official unemployment figures. The idea was to time messages around these recurring peaks of media interest in the statistics, and increase the profile of solutions to youth unemployment. We began by auditing the Commission’s content, on and off-line, to get to grips with what unique research and insights could form the heart of our communications. UKCES have a lot to say – in the form of case studies, reports, blog posts. Together we scoured what was available to discover what could travel further as part of this campaign. Looking at the habits of our target audiences – employers, business people and the business media – we could see that opinion, tips and advice, and visual content were key, with inspirational quotes and headline statistics proving popular. At the same time, Twitter’s update to preview images within timelines gave us an opportunity to try a different approach. We knew that to break out of the ‘skills bubble’ we needed something with wider appeal that the conventional, statistics-led messages. With work experience as our first focus, we worked with the UKCES team to find something everyone could relate to. Out of that came the concept: #notjustmakingtea. In the run-up to the release of the unemployment figures, the UKCES team asked their partners and contacts to share their experiences of work experience, and some key stats. We created animated slides picking out some of the most useful facts and stats, and as soon as the latest unemployment figure was released we highlighted the youth stat in a stop-motion Vine video. The impact? UKCES found their messages getting unprecedented reach, and triggering richer interaction around them. 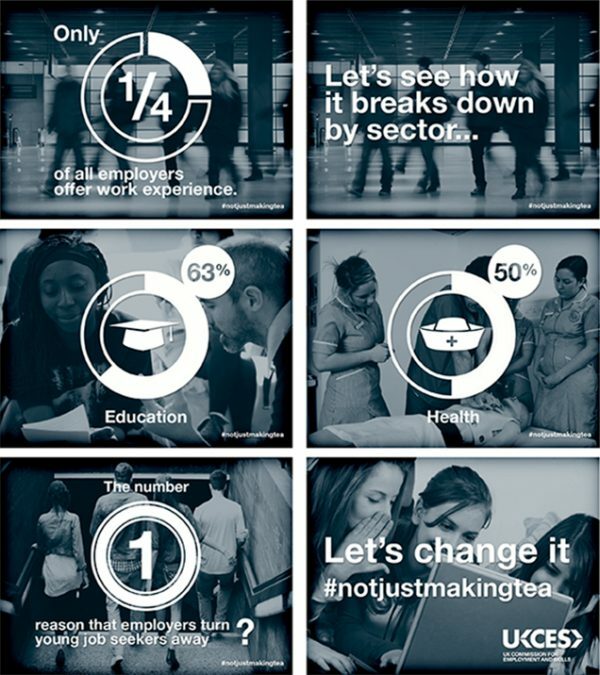 By having an accessible, interactive basis for conversation – #notjustmakingtea rather than industry jargon – we created more opportunities to generate attention. The UKCES team were energetic, warming up partners ahead of the day and fostering the conversation as it happened across social media channels. And the designed content assets gave them more to talk about, and more for people to share. Taking what we’d learned, for the January 2014 campaign we wanted to make the conversation go further. Just as most of us have personal anecdotes of work experience, most of us have people we’d like to thank for help in our careers. Just the kind of help young people need now from employers to give them a chance. So we started a social media chain reaction of appreciation, asking people to share their gratitude. 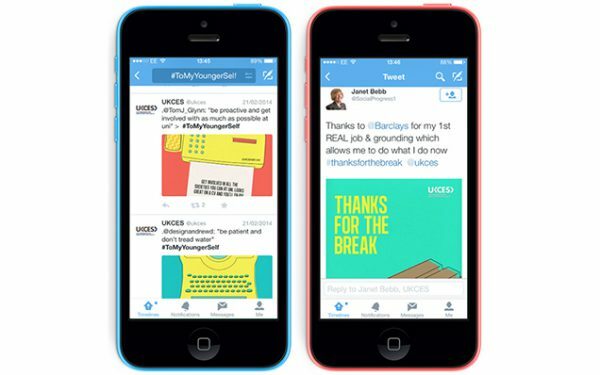 Fuelled by brightly designed e-cards, the campaign took a feel good, nostalgic approach and attracted even greater reach and interaction than #notjustmakingtea. The previous month’s campaign showed that UKCES could generate attention around an idea not specifically tied to a sector or type of employment opportunity. With #ToMyYoungerSelf, we pushed the idea of engaging with people’s personal experiences of work, and thinking about what they might do differently if just starting out now. 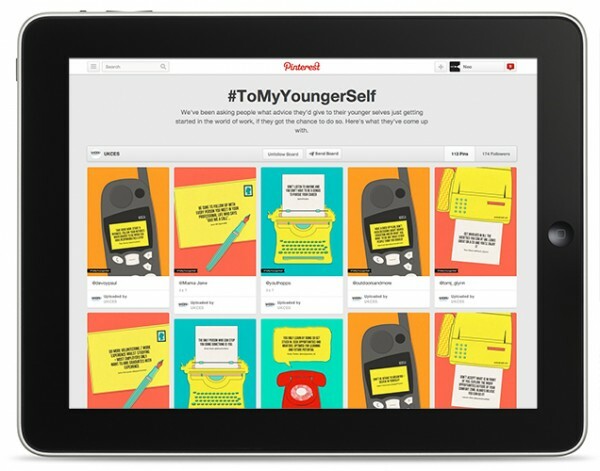 Developing the shareable e-cards that had travelled so well before, we made editable templates that the UKCES team could populate with the messages they saw coming in though social media. The impact was even bigger than for previous campaigns, with the highest engagement levels across the six months of activity. 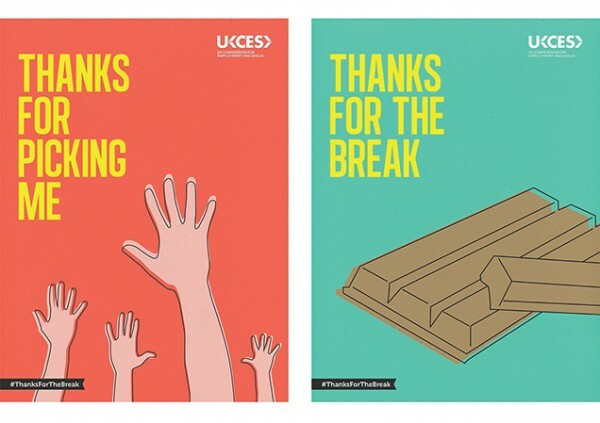 UKCES wanted the campaign to shift the way that employers think about employing young people, and really appreciate the benefits and support available. And as part of that, they wanted a shift in perspective about them as an organisation, to be known as an attractive partner for businesses, and go-to people for reliable, well-communicated information about employment and skills. Together we saw how positive messages can be just as powerful as alarming ones, and how serious messages can be delivered with a light, conversational touch and without funeral colours. Through the course of the campaigns, UKCES’ Twitter following jumped by 25% to over 7,500. The messages were picked up and spread by bigger government departments, such as the Department of Education and Department of Business, Innovation and Skills, and major employers such as Nestle, Hilton Worldwide and O2. Even more excitingly for the team, the campaigns enabled UKCES to engage with many individuals and organisations for the first time, outside the conventional ‘skills bubble’. out of the skills bubble.